When Theresa May’s deal is defeated, the fight against Brexit continues. It’s crunch time. We are exactly one week away from the parliamentary vote on the Brexit deal. With the Tories divided, and the opposition increasingly united against Theresa May’s proposals, it’s more likely than ever that we will defeat it. When the deal falls, the fight continues. We need to escalate the pressure for another referendum – and start preparing for it. 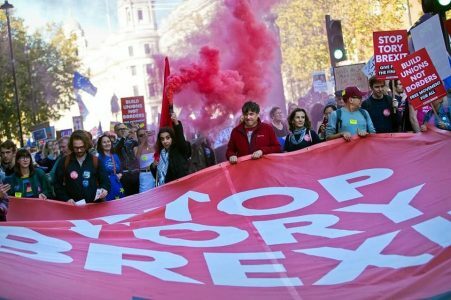 Together, we can make 2019 the year we beat Brexit – or we can allow Tory Brexiteers to carry on with their plans to end free movement, scrap our workplace rights and environmental protections, and sacrifice the livelihoods of working class people. That’s why, on the 15th and 16th of December, we are calling another weekend of action. We will be running stalls, knocking on doors, leafleting and having thousands of conversations about why and how we need to stop Brexit. We’ll be talking about the change we really need: not building more borders but investing in public services, strengthening workers’ rights and redistributing wealth and power in society. While public opinion is shifting against Brexit, we still have millions of potential voters to convince – and we need your help. Organising a local campaigning event is easier than you think – register your interest here and we’ll soon be in touch.